Personal grooming, and hygiene in particular, is part of the general Lemko culture. Come Saturday evening, the entire family would bathe itself "from head to toe", and on Sunday, dressed in festive clothes, they would head off to church. It was acceptable to be slightly dirty by the end of the week, but never at the beginning. One could wear patched up pant-legs on a workday, as long as they were clean and not torn. Women very rarely wore something with patched up holes, for this demonstrated poverty or stinginess. Most mended clothing was worn by young herdsmen, but that did not surprise anybody, since the herdsmen did not bother to take care of their clothing. Washing and mending clothing was exclusively a woman's chore and a "decent" hazda (master of the house) would never stoop so low as to sew on even a single torn off button. Whether from thriftiness or just from habit, only thin linens were washed with soap, rough working garments were washed with "luh". "Luh"- ashes from deciduous trees, the best ashes coming from beech or oak trees. Ashes were added to boiling water, and when the water turned cold - it was used to wash the laundry. Each hazdynia (mistress of the house) had a special "tseberka" (bucket), "shaflik" (washtub), and a "ryebychka", a beech wood washboard board with "ribs", on which the clothing was washed. 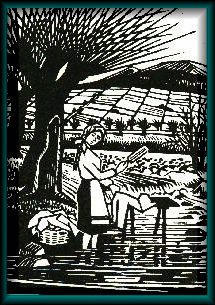 The laundry was carried to a nearby brook or a small stream where it was washed with "pr-eye-nyk" (wooden hand paddle), and rinsed in clean stream water. Depending on the weather, the laundry was dried out in the sun or indoors. Big loads of laundry were set aside to be done on rainy days or Saturdays. Once the garments dried out they were "smoothened" with a wooden "ramach"* or an iron, heated by charcoal. Gray linens made from flax, newly woven on a loom, demanded the greatest amount of work. For this purpose special wooden barrels - "zvaliarnee" were used, they stood on three legs, with a hole at the bottom for drainage. Such barrels handled several pieces of linen at a time. At the same time they would get the stove going, heat water for the ash, and heat three to four rounded stones until they became red hot. The bottom of the barrel was lined with burlap, water containing ash was poured into it, followed by the hot stones. All of this was covered with another layer of burlap, and finally the linen. The top of these barrels was then covered with burlap or blankets. This is how the linen was steamed, until it was completely softened and bleached out. Then they washed it on a washboard by the stream, and whitened the fabric for a long time by exposing it to direct sunlight, while pouring water over it. * "ramach" - a large hardwood paddle, with vertical grooves cut into it.